Crock Pot Cheeseburger Casserole is made used ground beef, corkscrew pasta, tomatoes, topped with sharp cheese and diced dill pickles. I had my doubts about what this would taste like when I started it but I just had to try it. I added a few more spices to it and this will be going into my rotation of things I’d make again. Those are even dill pickles on top. They actually helped pull the whole thing together. I bet your kids will love this dish! 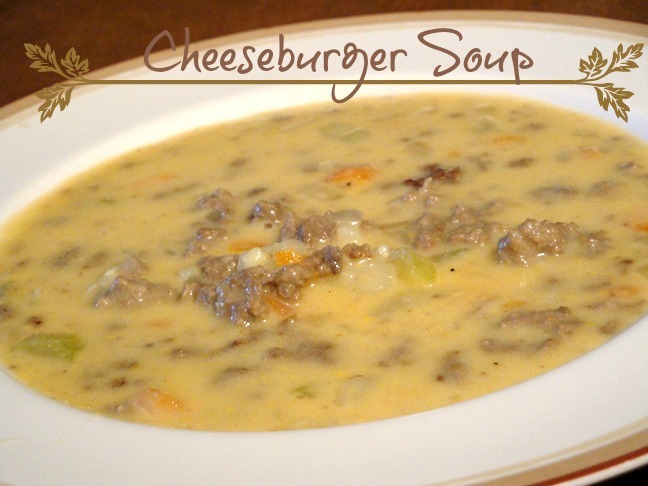 This cheeseburger casserole is real easy to make, I browned the ground beef and onions on the stove and added it to the crock pot with the tomatoes and spices. I let it cook on high for 3 1/2 hours and then added the cooked noodles in. 15 minutes later I added the cheese and pickles. When the cheese is all melted it is ready to dive into. Don’t skip the pickles! 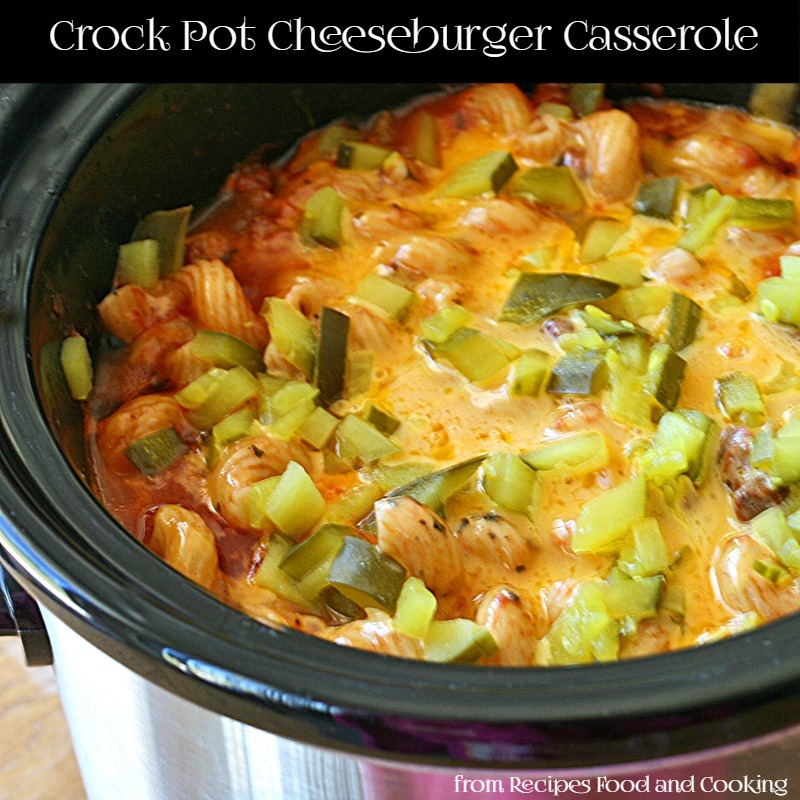 Crock Pot Cheeseburger Casserole – you’ll want to dig right in before it’s done! Crock Pot Cheeseburger Casserole is made using ground beef, corkscrew pasta, crushed tomatoes and then topped with sharp cheese and diced dill pickles. Brown the ground beef on the stove with the onion. Spray the crock pot with cooking spray. Add the ground beef and onions to the crock pot. Bring a large pan of water to a boil. Add a teaspoon of salt. Cook noodles until almost done. Drain well and add to the crock pot. Stir until well mixed. Cover. Add the cheese and top with the chopped pickles 15 minutes after adding the pasta. Cover again and wait until the cheese melts to serve, it will take about 15 minutes depending on your crock pot. 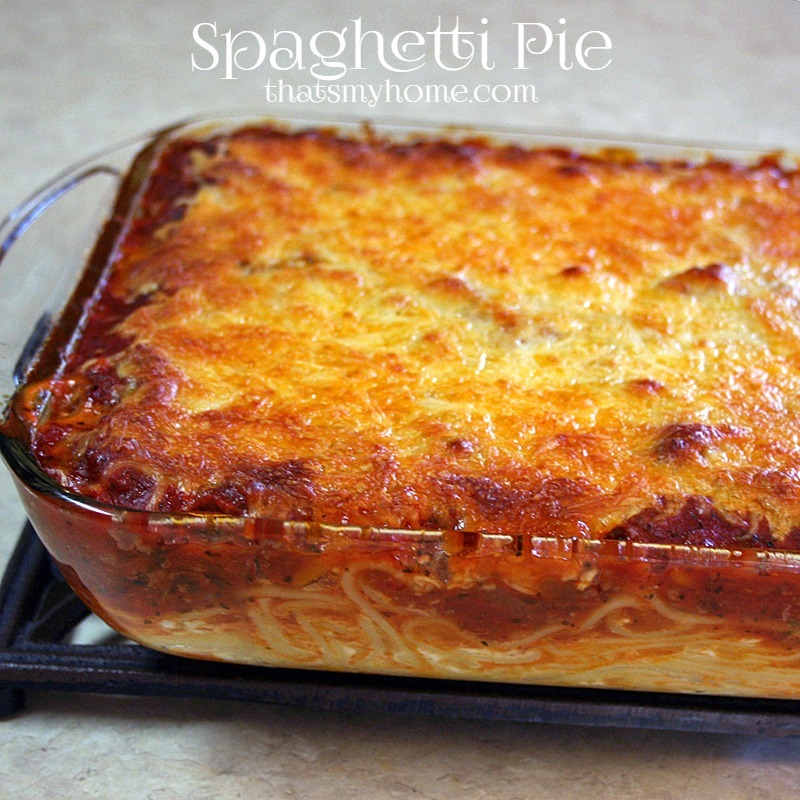 This is ultimate comfort food Mary Ellen! I must try this soon! It was so good Sarah! I was surprised how much like a cheeseburger it was like. Hope you do Sheena, I bet your little girl will love it. Oh, I think my big kid will love this! Great idea on adding chopped pickles to keep with the authentic taste of a cheeseburger! I think the pickles made the dish! We loved it, hope you do also. Looks delish Mary Ellen! I need to start making a list of crockpot meals I can make so dinner is easier when I get home from work during the week! I bet that would help a great deal! Sarah has a ton of great crock pot recipes. Oh my gosh, I am so making this! I might just do it all stove top though! Great looking meal! I love that this uses such common ingredients! Don would absolutely love this! Love your version. I agree that the pickles are key! That’s an interesting twist, let me know how it turns out, I’d be interested in hearing. This looks great! What a fun dinner idea! I love that you made it in the crock pot too. Easy and yummy, what more could anyone want! 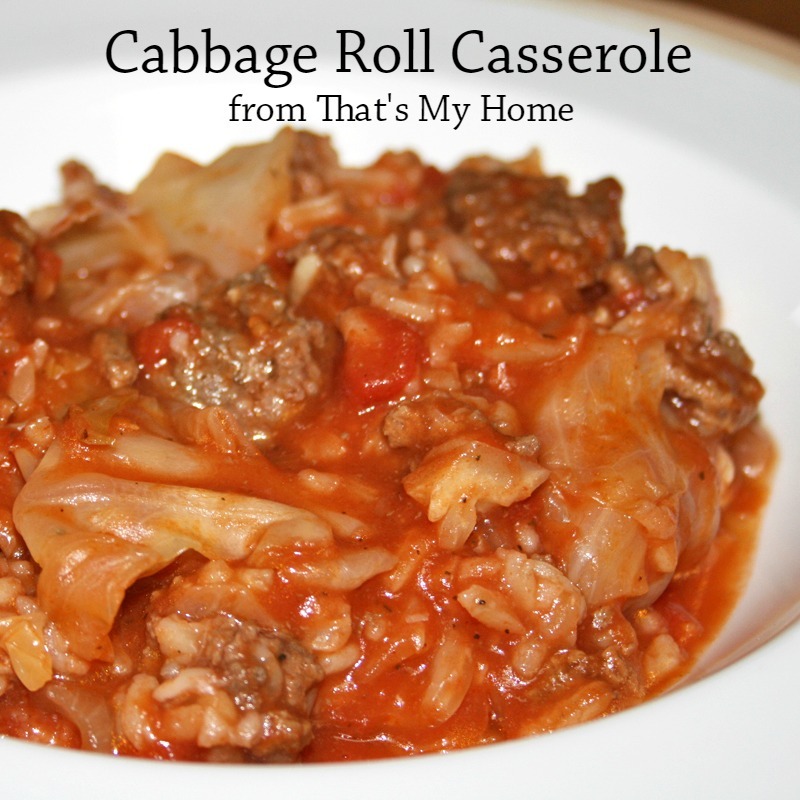 I am making the cabbage casserole tonight! Can’t wait to try it! Is that 2 cups of dry pasta? Thanks! Yes Kristine it is dry. I made this today. My family & I loved it! A little more meat next time, and extra cheese. Yummola! Thanks for sharing this recipe. So glad you all enjoyed it Donna! I guess you could try beef or chicken broth in place of the tomatoes. I’d just omit the mustard if you don’t like it. That’s my best suggestions but it will change it significantly. I noticed the last ingredient is “3/4 cup diced dill pepper”. Based on all the comments, I take it that is that supposed to be dill pickles? Yes it is supposed to be dill pickles. I think I need an editor. Thanks for letting me know! When it says cook for 3 1/2 hours. What heat level are you meaning? I don’t know exactly what to set my crock pot on…first time ever using one! I usually cook on Low. If the time is for 8 hours use low. If you want to do it faster cook on High for 4 hours. Hope you enjoy it! Could this be easily adapted to the insta pot? Wow this is really good! I made this in the Instant Pot by sautéing the meat and onions first, then adding all the other ingredients (including the pasta) and adding some chicken broth (that’s all I had in the cabinet), just enough to cover the pasta. Set it on high pressure for 10 min and quick release. Mixed in the cheese afterwards and topped with the pickles. I’ll have to try my pressure cooker. Thanks for letting me know. I have yet to cook pasta in mine yet.